Have you ever imagined what it must be like to fall down a rabbit hole and end up in Wonderland? Well, a friend and I recently had the pleasure of doing something just like that, as we attended the most fantastic event called 'Dining With Alice'. Produced by those clever folk at Artichoke (creators of unusual large scale events), it was a completely absurd dinner party set in the stunning gardens of Elsing Hall in Norfolk, and certainly befitting of a Mad Hatter. After booking the tickets, I received an entertaining letter from Her Vivacious Majesty, The Queen of Hearts, with full written instructions for the evening. So off to Norfolk we headed, and before long we were on the bus from the normality of Norwich to the surreal splendour of Elsing Hall. It was early evening and the sun was shining as we entered through the perfectly manicured topiary garden (not exactly a rabbit hole, but definitely more exquisite). As we made our way along the neat grass paths, we caught a glimpse of pale blue and blonde dashing between the topiary. Alice. We then knew we had arrived in Wonderland and filled with sudden excitement, we carried on our merry way. Whilst Alice continued lurking behind the bushes. Elsing Hall is a privately owned 15th century medieval moated manor house set in its own parkland with an arboretum. Serenaded by peacocks, we found our way to the marquee where we were greeted by a string quartet and a wonderfully refreshing Hendricks gin and ginger ale cocktail (my new favourite tipple). As the guests (approx 250) gradually arrived, Sally and I took in our surroundings and studied the rather baffling table plan - 'Imogen Parson: Yellow 6' didn't give much away, and Sally's 'Purple 2' wasn't any help either. Curiouser and curiouser indeed. Before long, all the guests had congregated and just as the anticipated chatter reached fever pitch, a bugle sounded and everyone hushed. Across the lawn, the Queen of Hearts, the Mad Hatter, the White Rabbit, Tweedle Dum/Dee, the White Knight et al, all arrived and took to the stage to introduce themselves with a daft ditty, including her Vivacious Majesty annoucing "We're late and it's still quite early. Let us leave no bird unstoned." 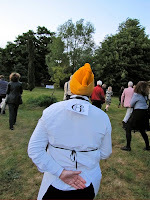 The bugle sounded once more and we were all ushered outside to witness an army of sixty waiters and waitresses dashing through the woods towards us, each donning a colourful turban and a number. As they all lined up in neat rows, performed a little song and dance whilst waving their white damask napkins, the table plan mystery unfolded. "Blue 8!" shouted one. "Green 7!" called another. Slowly but surely, all the guests started filing off to meet their respective Turbaned Chiefs. I bid farewell to Sally as she trotted off with 'Purple 2', whilst I disppeared with 'Yellow 6'. With around 4 guests per waiter, the next sene was very surreal as each waiter marched their posse of guests in various directions across the vast gardens to strategically placed and beautifully laid white tables, scattered absolutely everywhere. The Yellow 6 team were taken right up into the woods and I took my place at a table set just for me, complete with a pineapple, jars of worms and colourful potions. Next to my name card was a teacup full of Mock Turtle Soup and a small glass phial containing orange quinine with a tag saying 'Drink Me'. Which I obediently did. In true Alice 'Drink Me' fashion, I was hoping I might start shrinking (if only it was that easy!) but alas no shrinking to be seen. It was quite strange looking around to see all the guests seated at individual tables, engaging in soup and potion with an equal amount of amused bewilderment. A short while later, the bugle sounded again and we were off. Team Yellow 6 left the woods and headed towards the rather lovely walled herb garden, passing diners along the way, all walking around in ever decreasing circles, heading for their next table. I spotted Sally and gave her a quick wave. The second course was at a table set for two - myself and a stranger (mingling is definitely the name of the game). We said hello and indulged in delicious crab pate and 'Drink Me' Chardonnay whilst listening to the nearby harpist. Meanwhile, the White Knight, Queen of Hearts and Mad Hatter were dashing here, there and everywhere, stopping for a quick chat with the guests. By the time the bugle sounded again, we had all got the hang of it and were ready to bid our fellow guests farewell and make our way to yet another table. I wisely decided to take my glass of wine with me as a necessary accompaniment for such intrepid dining antics. Sally and I were relieved to finally be reunited for the main course and were lucky to be seated at a perfectly positioned table under the trees, next to the moat overlooking the house. We were joined by a nice couple and all tucked into a very tasty hot pie (we gave the cold veg a miss), and a bottle of red - this was definitely my favourite table and course. As dusk fell, I was grateful that I'd heeded the advice to 'dress up warm' as it had turned into a very chilly evening. The final course was the most magical, as by now it was completely dark apart from an endless array of pretty tea-lights, fairy lights and paper lanterns reflecting on the moat. All the guests were escorted to the rear of the house which looked so beautiful, illuminated in gorgeous glowing colours - it was a romantic and breathtaking sight to behold. A platform of tables and chairs awaited us, so we took our seats and enjoyed miniature cakes, titillating elderflower and raspberry jelly, cups of tea and more wine, whilst our eccentric host of loveable characters took to the stage with the house as a backdrop, and performed their batty finale. We all joined in the Victorian parlour song, "Come into the garden, Maud". Alice finally appeared (joined by a few other younger Alices) protesting her disgruntlement at the ridiculousness of it all. The evening drew to a close and we were soon heading back 'up the rabbit hole' to Norwich and mundane reality. 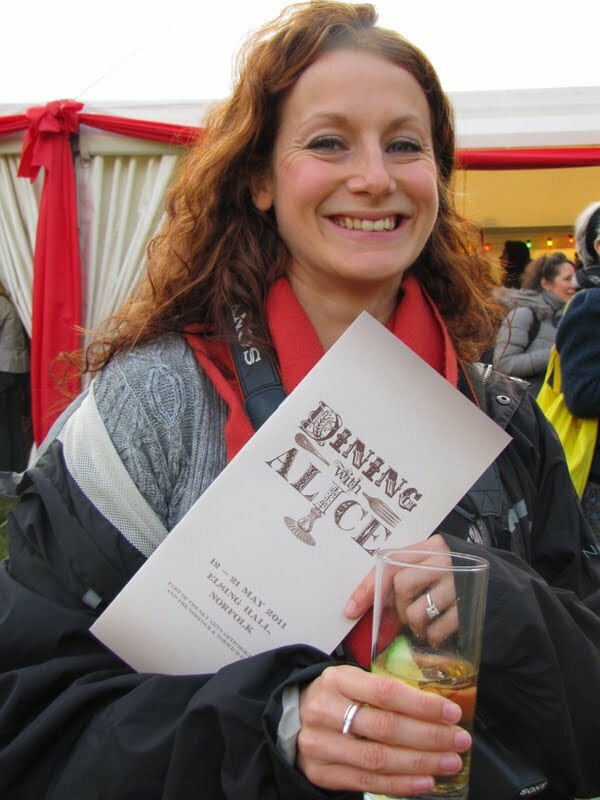 'Dining With Alice' was really very special and I was particularly impressed with the incredible organisation and attention to detail. Bompas & Parr did an excellent job providing the food in their imitable bonkers manner. It was an utterly brilliant evening of chaotic fun and nonsense, a feast for the imagination and something I will remember forever. Lewis Carroll would have been proud.